A crowd of Second Amendment rights activists, survivors of gun violence, students, concerned parents, and law enforcement officers showed up at the Texas Capitol on Thursday to give lawmakers their views on two high-profile gun bills. Editor’s note: This story has been updated to reflect committee passage of the bills. After a hearing that lasted almost eight hours, the Senate State Affairs Committee passed bills that would lift a ban on concealed handguns at university campuses (Senate Bill 11) and allow license holders to carry holstered handguns openly (Senate Bill 17). Both measures passed 7-2, with the committee's two Democrats voting against, and now proceed to the full Senate. Colin Goddard, who was shot four times during the 2007 Virginia Tech shooting in which 32 students and faculty members died, was among those who spoke. He asked lawmakers not to use the Virginia Tech tragedy to justify campus carry bills. Several police chiefs also testified against the measures, saying they would strain law enforcement and make it difficult to identify perpetrators at the scene of a crime. Open carry would create a “huge fiscal burden” on police departments, said Chief Art Acevedo of Austin, both in the additional training needed to educate officers and resources needed to respond to increased calls involving firearms. Will Johnson of Arlington gave senators DVDs with a video clip of open-carry activists interfering with police duties. 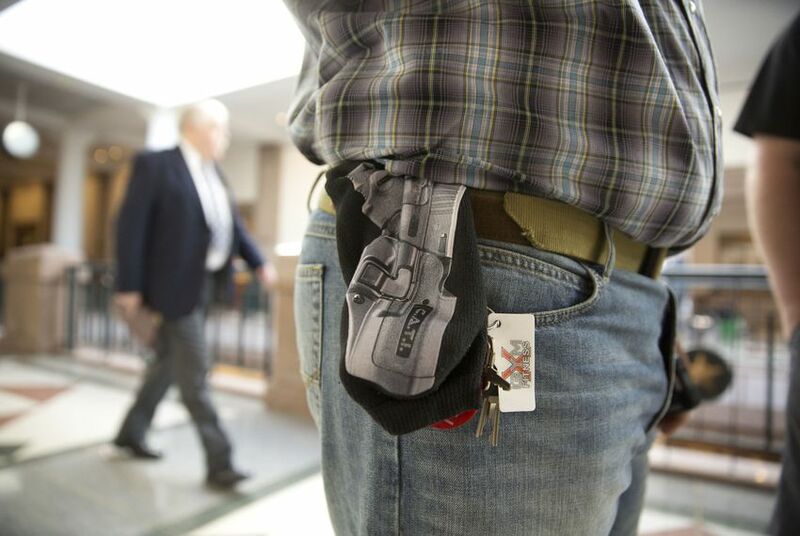 His city is the home of Open Carry Tarrant County, one of the most vocal gun rights groups. Though gun rights supporters from a variety of groups across the state voiced their support for the bills, some made clear they would like even fewer restrictions than the legislation proposed. Also among them was Kory Watkins, an activist with Open Carry Tarrant County who has earned notoriety around the Capitol for being kicked out of a lawmaker's office on the first day of the legislative session. “I will walk around until my feet bleed to make sure you are never an elected official again," Watkins said to lawmakers who opposed allowing open carry without a license. His two minutes of testimony concluded without a single question from senators. On the issue of campus carry, senators got dueling views from the chancellors of the state’s two flagship university systems on whether allowing concealed handguns would affect student safety. Neither Texas A&M University System Chancellor John Sharp, nor University of Texas System Chancellor William McRaven appeared in person before the Senate State Affairs Committee, but senators read aloud letters from both on “campus carry” legislation. Sharp said campus carry did not raise safety concerns for him, a view that contrasts with that of McRaven, who sent his own letter to legislators in late January, cautioning that such a law would create "less-safe” environments. But Sharp made clear he was only speaking for his own university system — and that his primary interest was in properly funding higher education. "The real question is this: “Do I trust my students, faculty and staff to work and live responsibly under the same laws at the university as they do at home?” Sharp wrote. "Of course I do! However, properly funding the higher education of these students is the only issue that counts!" Ryan McCrimmon and Eva Hershaw contributed to this story. Disclosure: The Texas A&M University System and the University of Texas at Austin are corporate sponsors of The Texas Tribune. A complete list of Tribune donors and sponsors can be viewed here.